Ask any serious motorcyclist and they will agree; the better the gear, the better the ride. Motorcycle luggage is no exception. Loud pipes, chrome exhaust and a custom tank all look and sound great, until you’re cramming some last-minute groceries in your backpack and pull out of a parking lot with a gallon of milk straddled in your legs. Embarrassment and hassles can be avoided with the appropriate motorcycle luggage strapped to your bike. Proper motorcycle luggage is important for any rider looking to put down more miles than their daily commute, but it can also come in handy for short trips to the store. 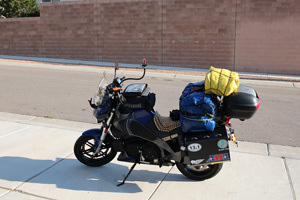 For more information on the importance of motorcycle luggage, Click Here. This entry was posted in Luggage and tagged adventure, bags, luggage, Motorcycle, saddlebags, tankbags, touring, travel. Bookmark the permalink.